So I dinged 77 last night and got my cold weather flying. Hopefully I'll be able to fly right thru to 80 (ok a mediocre joke at best). Since I'm approaching 80 I assume many of you are as well, or have reached it already. Time to start looking at Arena Season 5. This season is full of new stuff and I highly recommend everyone read this article on wowhead that is simply the best Arena prep article I've come across bar none. I'm also going to shamelessly borrow their gear lists because it's a nice format and easier then typing out. To keep it simple today, I'm just going say that S5 will have 3 tiers of gear. The differences in stats are similar to Season 1 vs Season 2 vs Season 3 gear... but all levels will be available you just need to meet the minimum rating requirements to buy them. 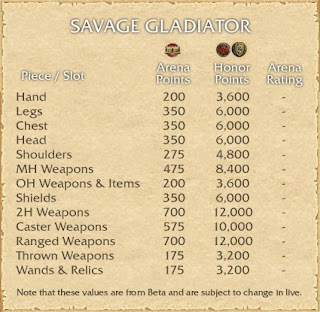 The lowest level is Savage Gladiator - This gear requires no Arena rating and is cheap to get. Starting at just 175 arena points and 3,600 honor even the worst Noobs should have no problems getting one piece per week. 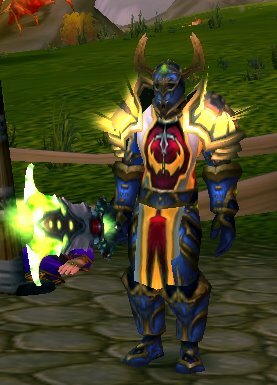 The vast majority of casual and new PvPers will keep this gear thru the entire season. 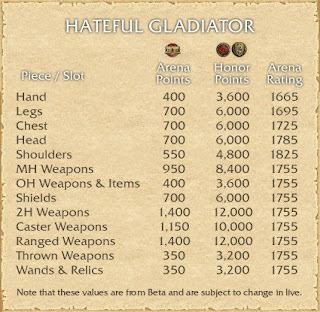 The middle tier is Hateful Gladiator - This is where the vast majority of serious players will end up. 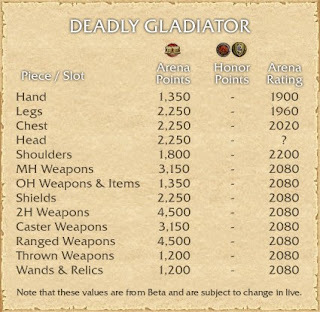 Honor requirements are the same, but each item costs more arena points and will require a minimum personal and team rating to buy. You'll notice the honor requirements are the same, just the arena points go up. Good news since many people will be buying Savage Gladiator first and then needing to grind more honor a few weeks later for the Hateful Gladiator version. So there you go. Upcoming posts will talk about the differences in Gear, what items you should be going for first, where to wait for a higher level of gear, etc. where did you find those great tables listing costs of the items? i can't seem to find it on the wow site. They're from the wowinsider article which is linked in the first paragraph.